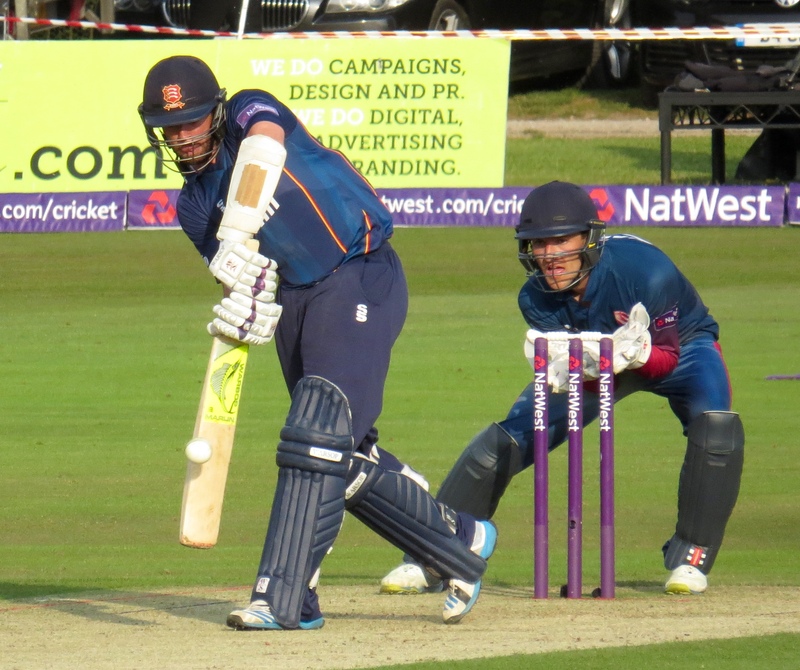 Having never been to Canterbury to watch Essex play I decided to head down after work for their T20 clash with Kent. 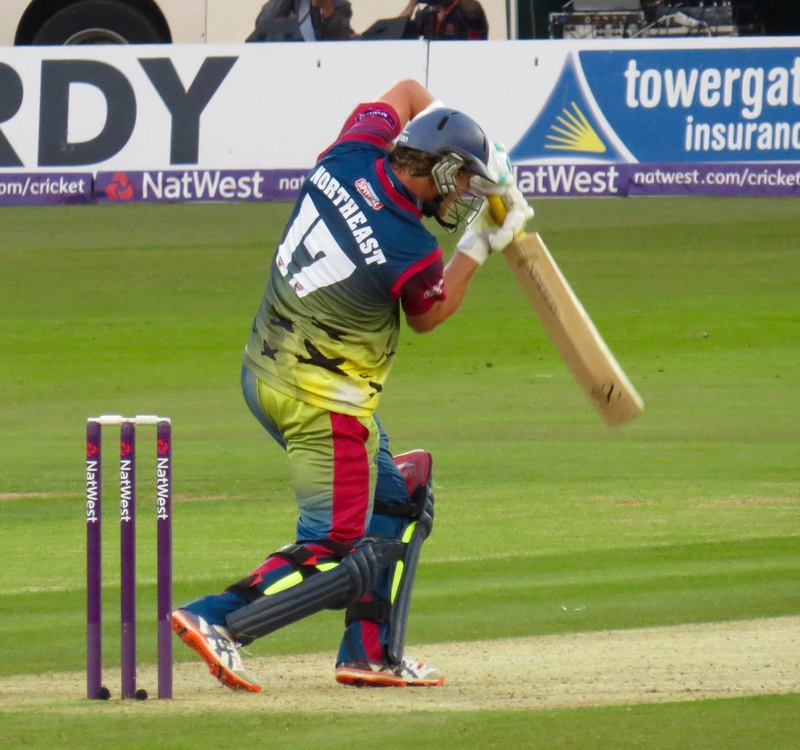 I may have been a bit foolhardy, I hadn’t really considered how far away Canterbury is! 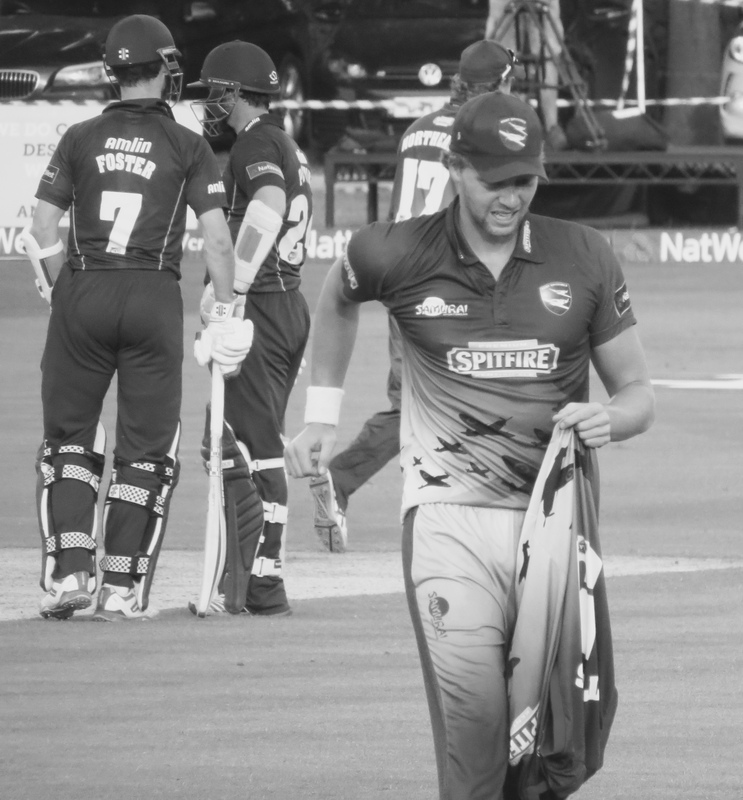 Typically the day was one full of accidents all over the M25 and M2, the M25 had cleared but not the M2 so my journey was longer than it needed to be. 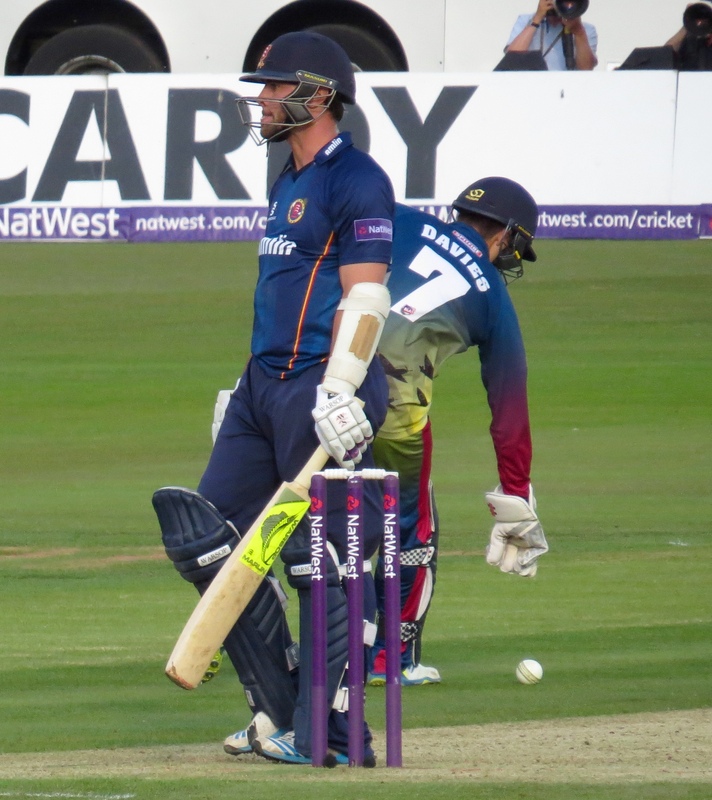 No idea where I went but my Satnav got me there and in plenty of time. 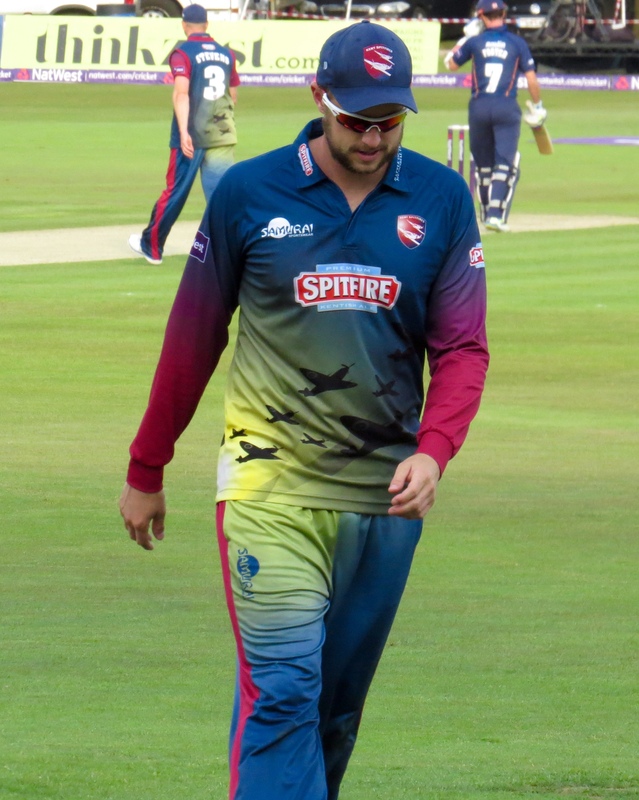 I hadn’t done my homework on parking before I left which was a bit of a schoolgirl error, yet my lack of planning meant I drove really close to the ground, took my chances on a side street and managed to park a short walk away. 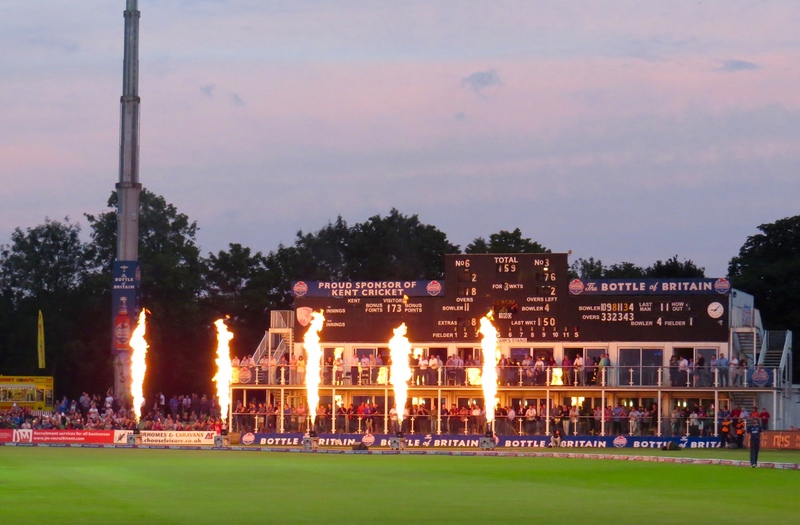 I’d heard good things about the ground and wasn’t disappointed, I had a ticket for the Woolley Stand but next time I’ll just go for ground entry I think, there are plenty of great seating options. 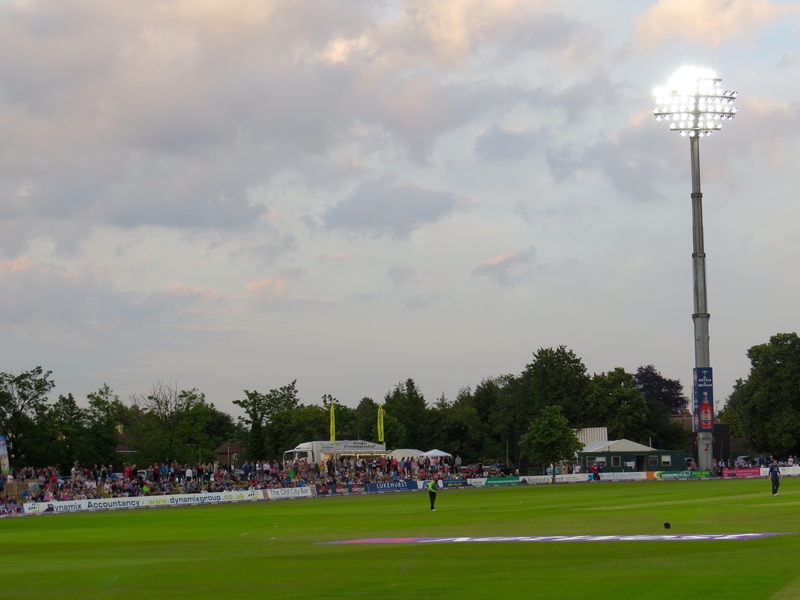 The food choice at the ground is great and includes a Thai Food provision and a cafe with cake and everything! 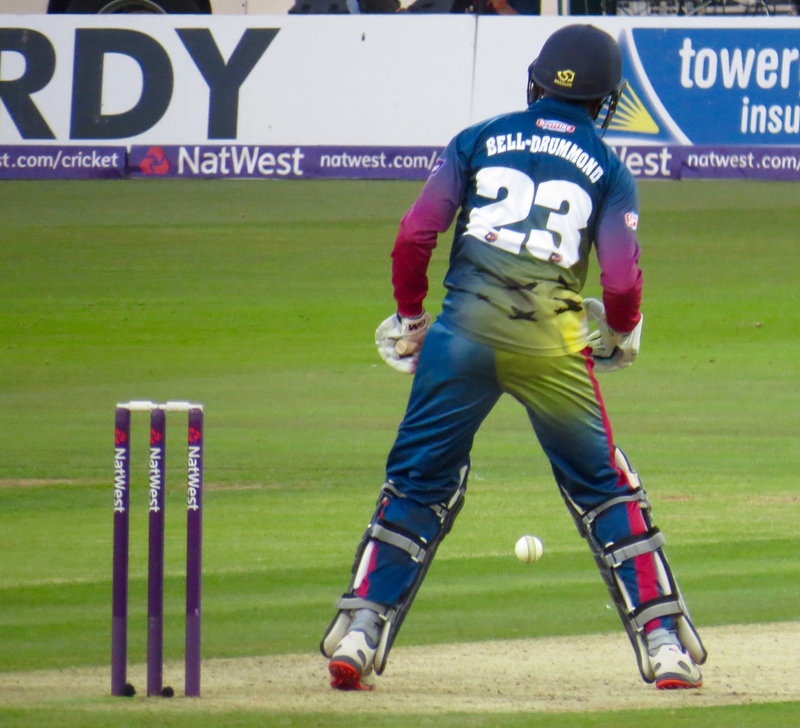 I had a really decent ham salad sandwich and flapjack, both were really good! 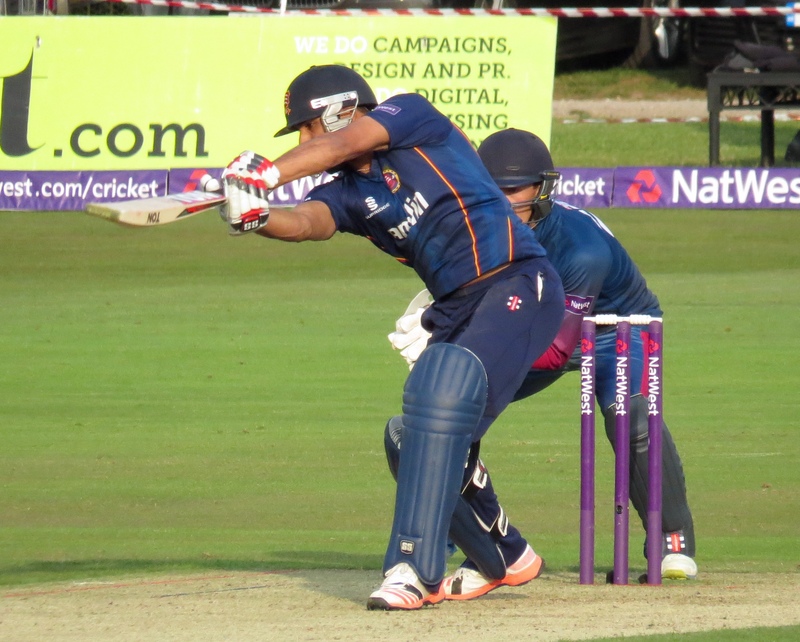 And so to the cricket Essex were first to the wicket with Mark Pettini and Jessie Ryder opening. 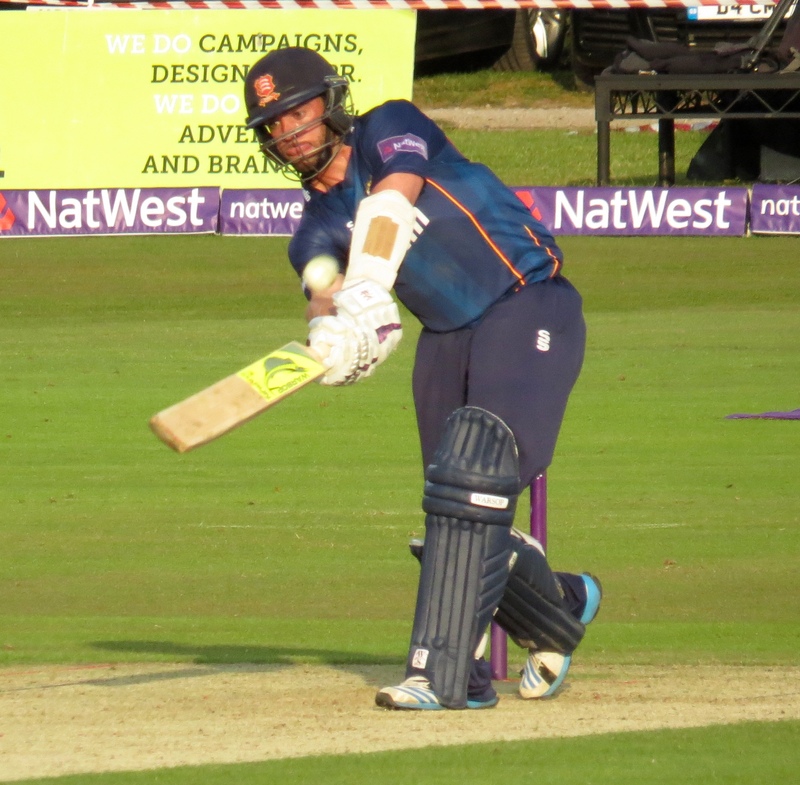 Ryder hit 26 from 13 balls, largely made up of boundaries, he hit six 4’s! 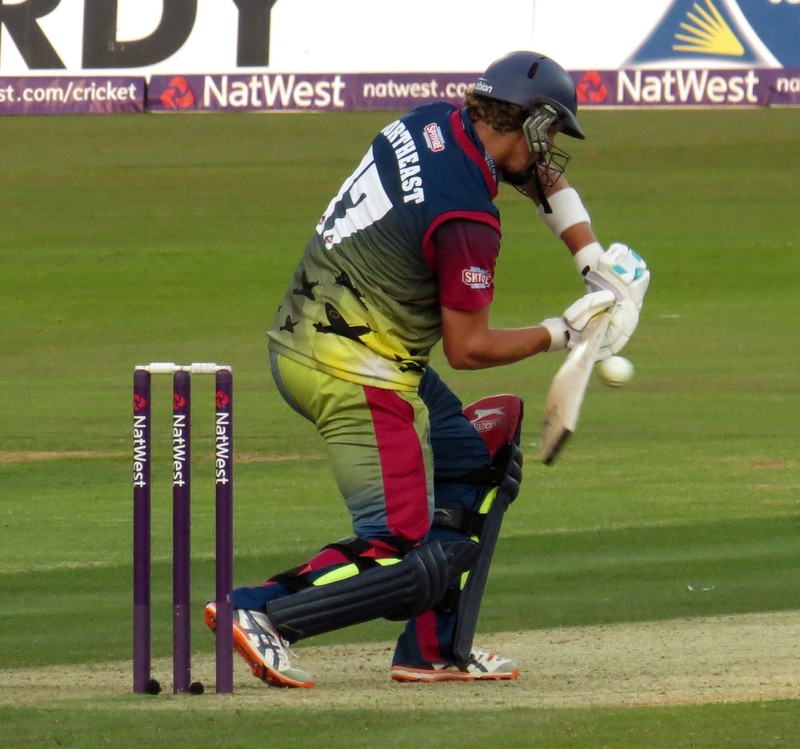 But was out LBW to Ivan Thomas. 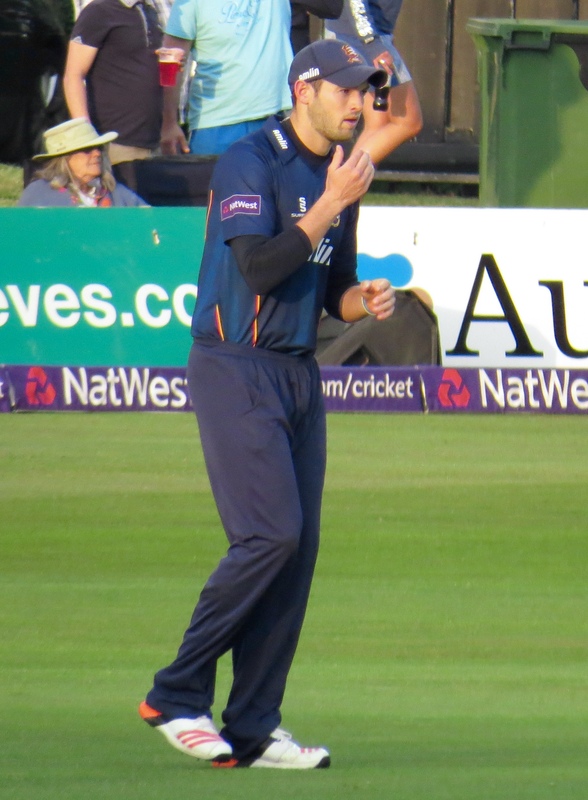 Pettini looked in form again and was at the crease for most of the 20 overs. 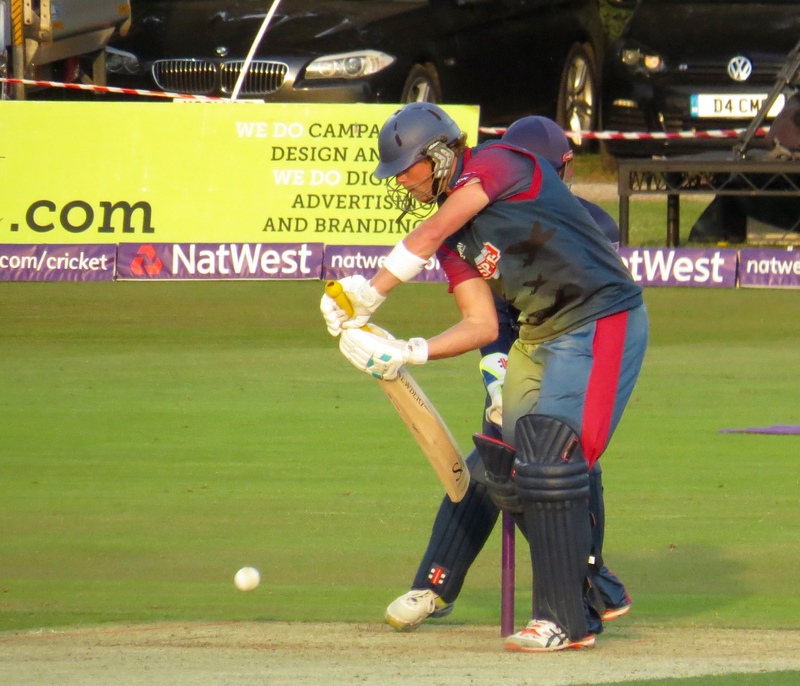 Tom Westley hit 13 from 16 balls before he fell to a good ball from James Tredwell. 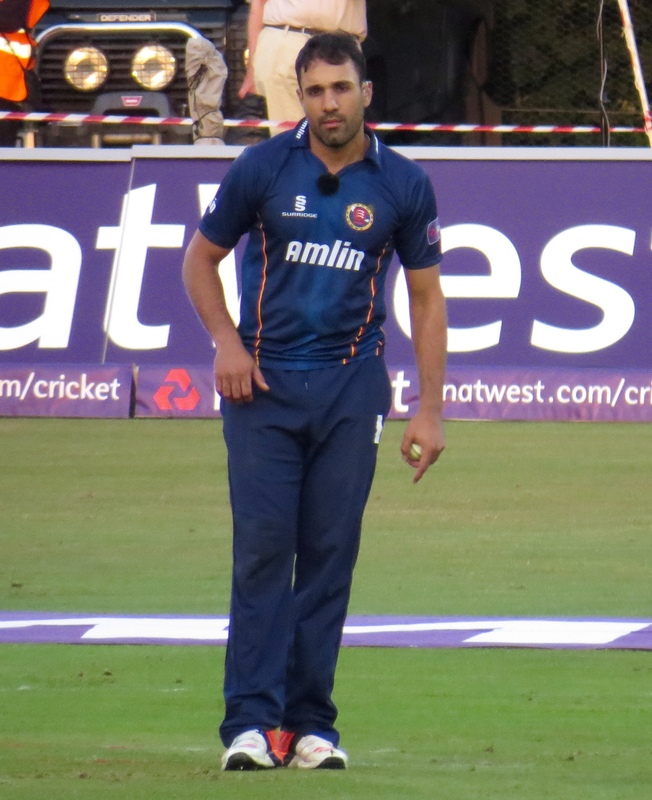 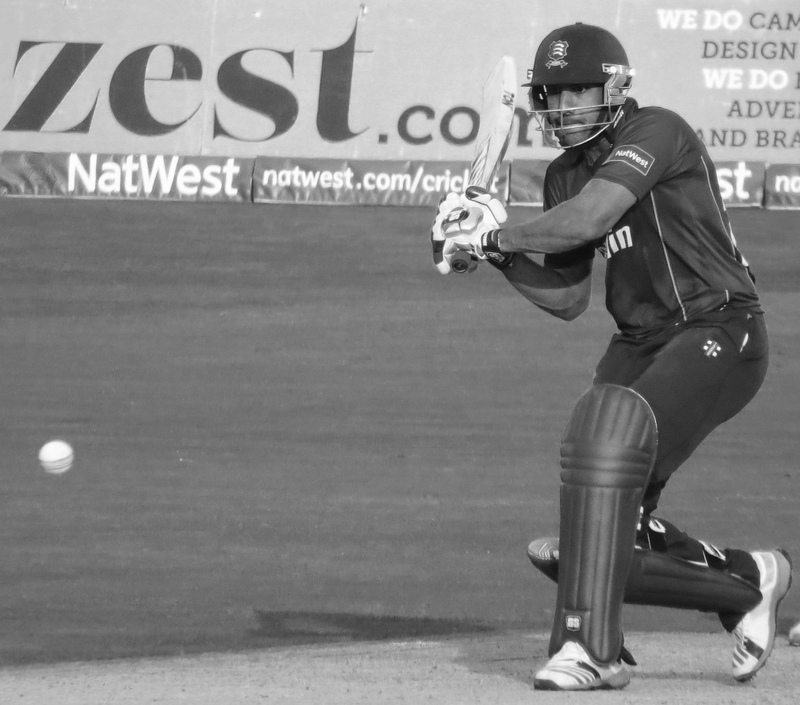 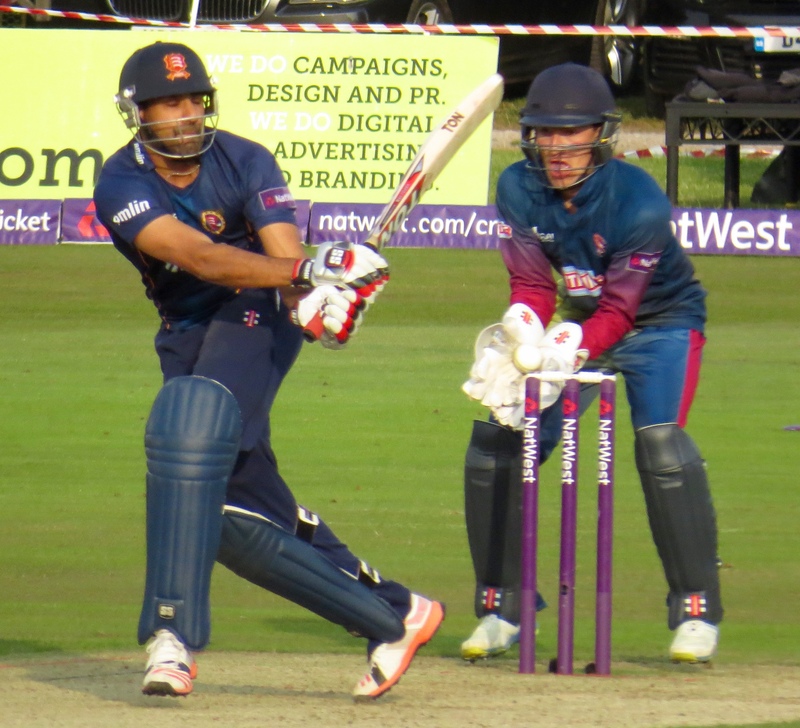 Ravi Bopara was next to join Pettini – he stayed longer and made a decent 31 – he and Pettini ran well between the wickets and put on 53 before Bopara was stumped by Ryan Davies from the bowling of Darren Stevens. 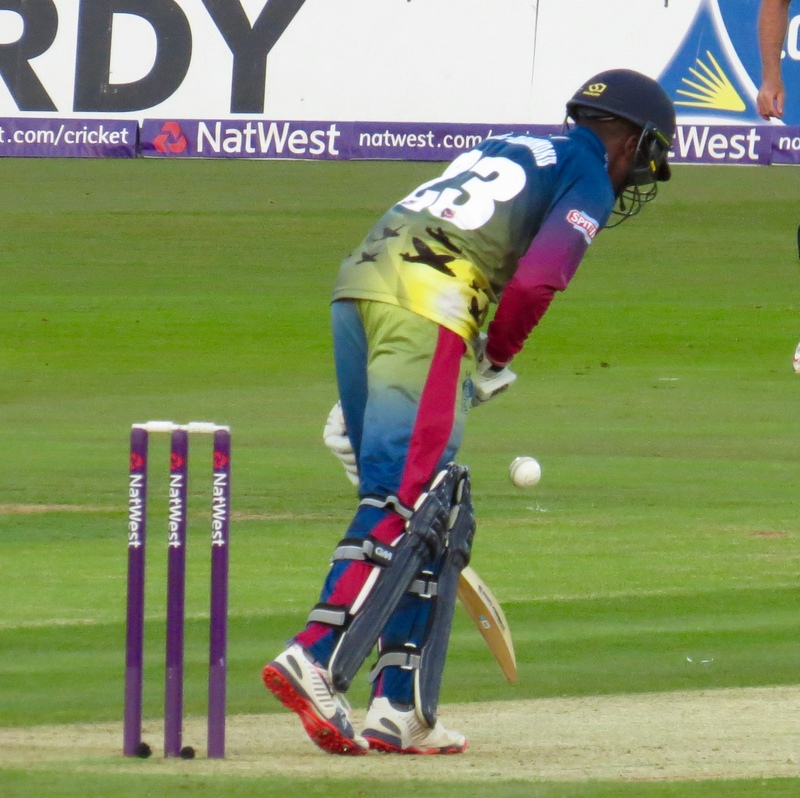 The stumping felt like an inevitability as Bopara had been going down the wicket a lot. 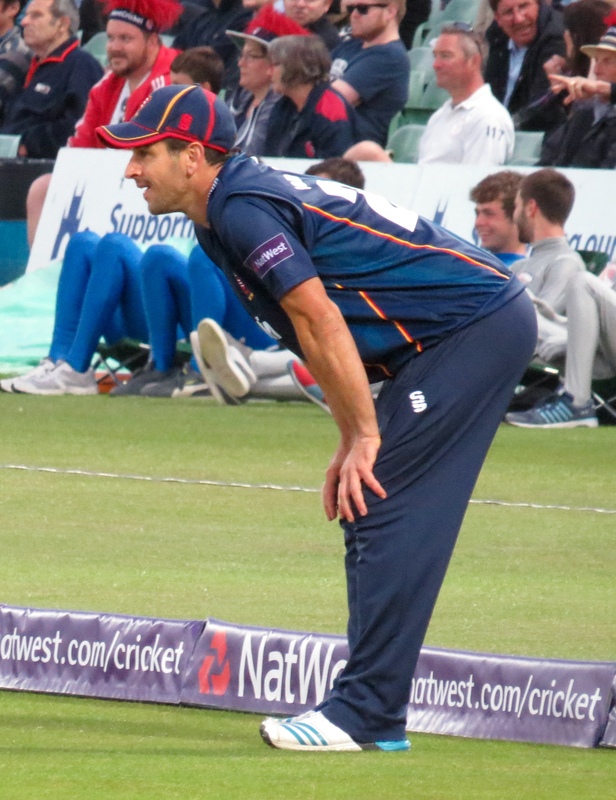 Ryan ten Doeschate again had a brief stay, facing only 4 balls he scored 2 runs before being caught by Alex Blake from the bowling of Matt Coles. 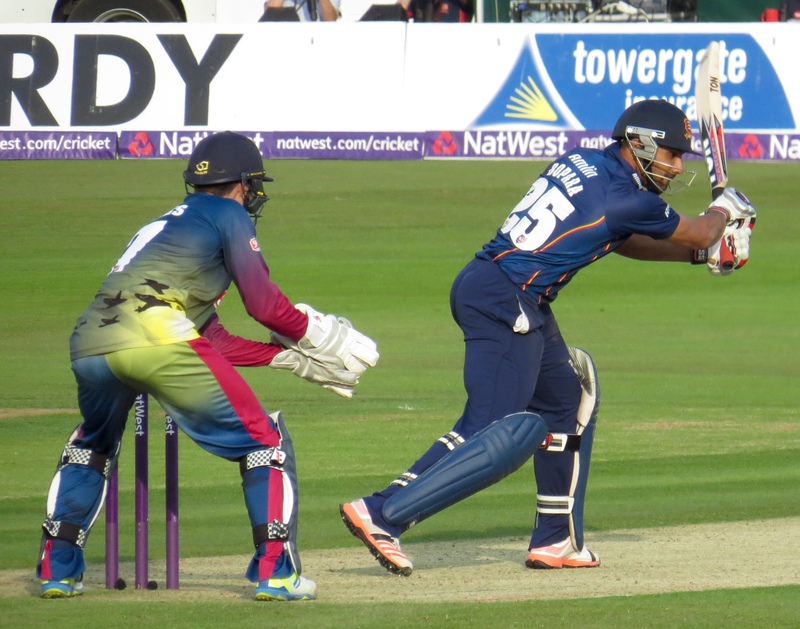 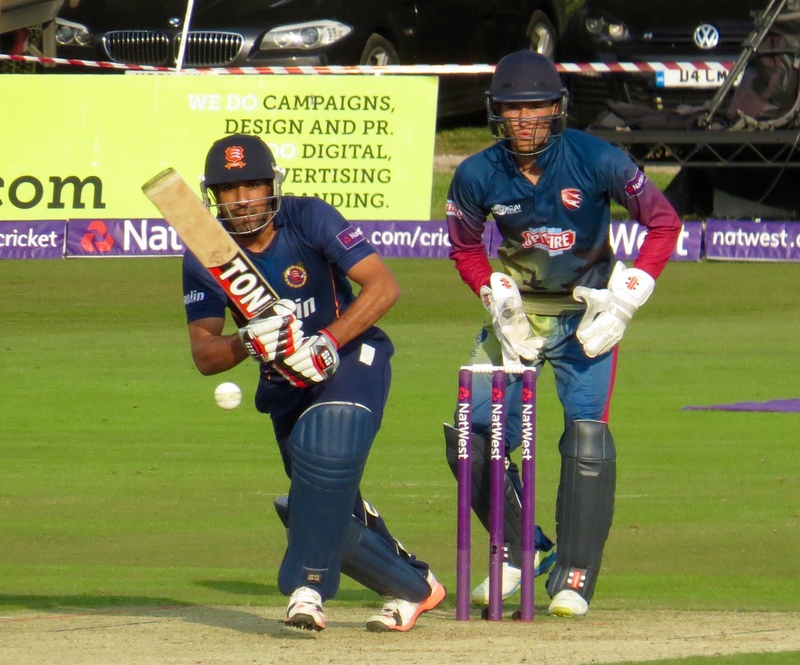 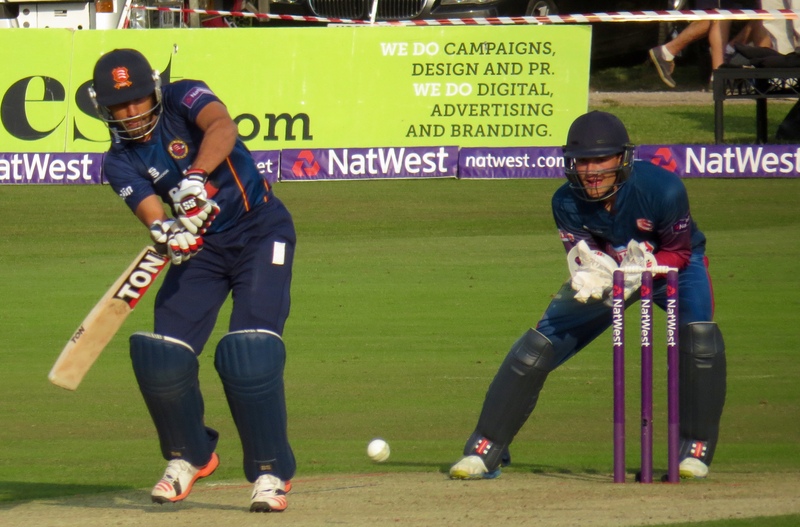 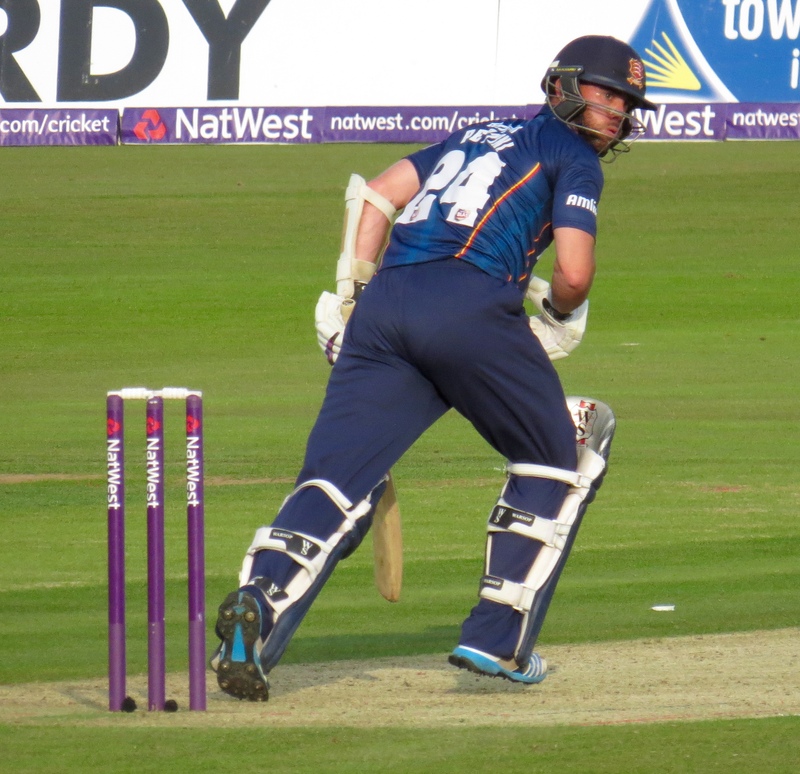 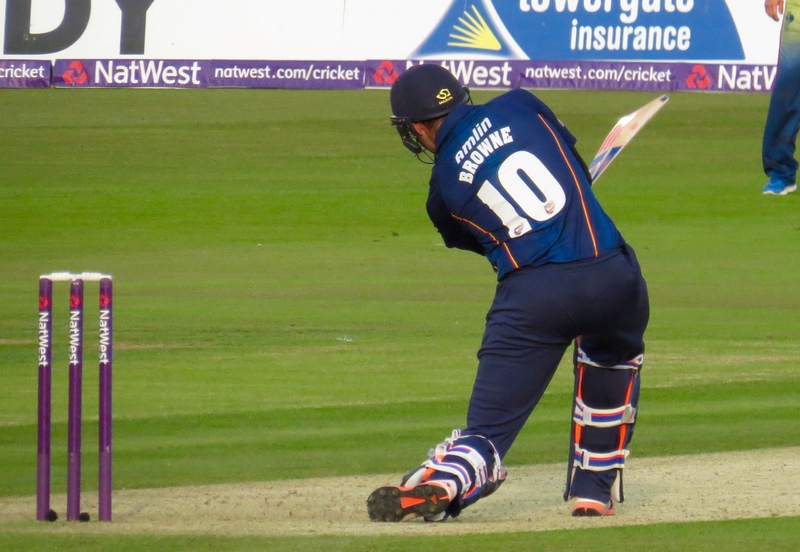 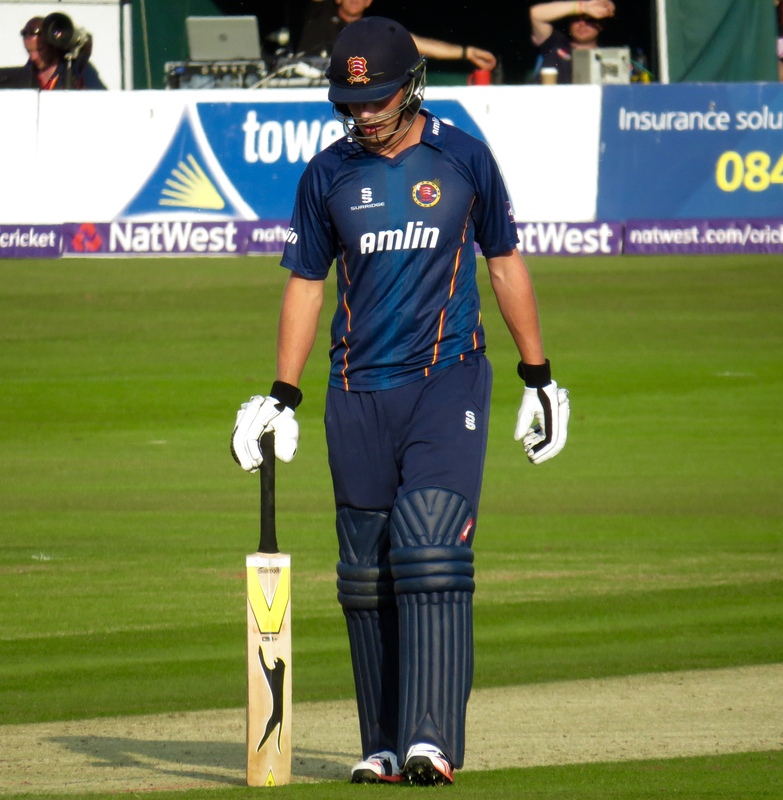 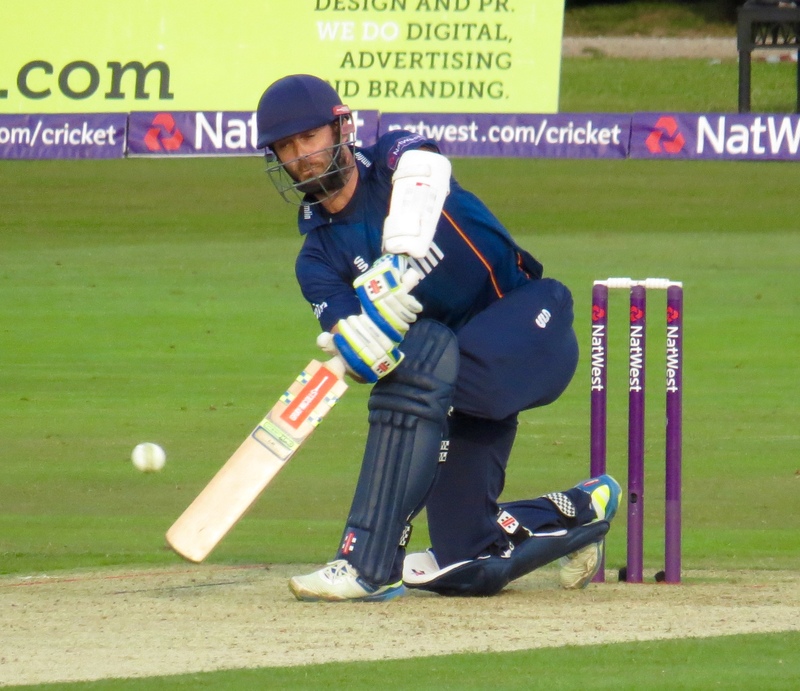 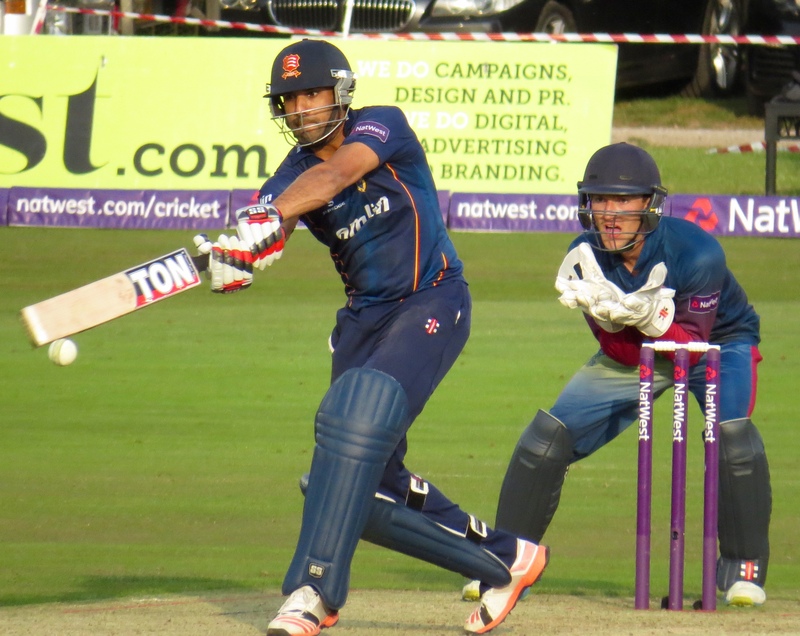 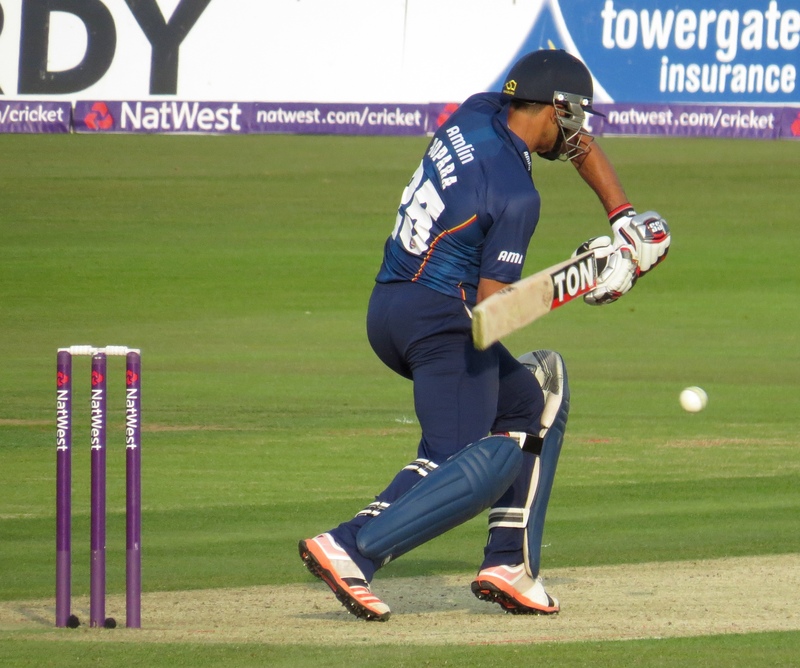 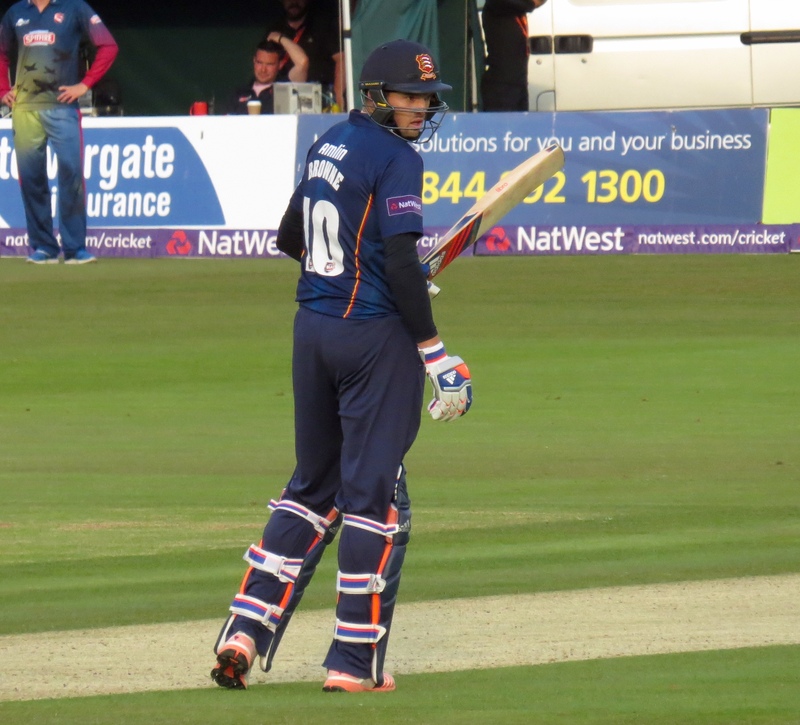 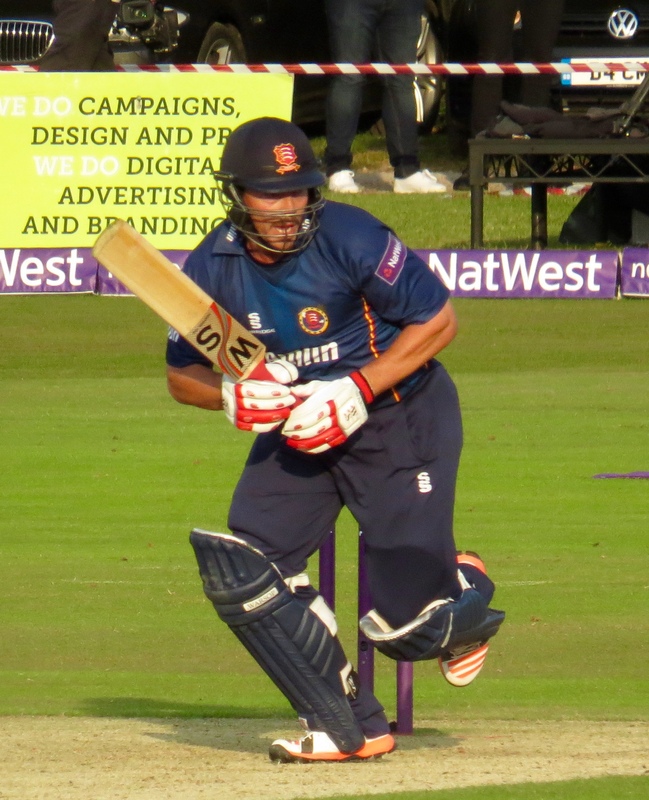 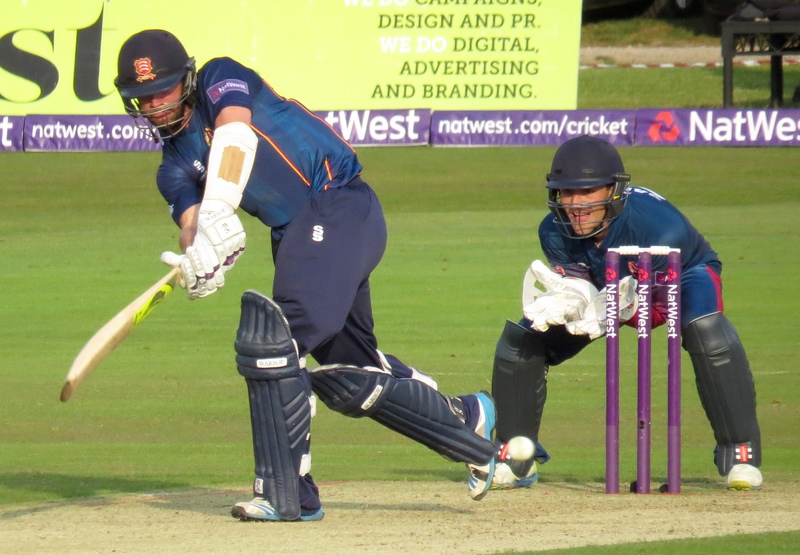 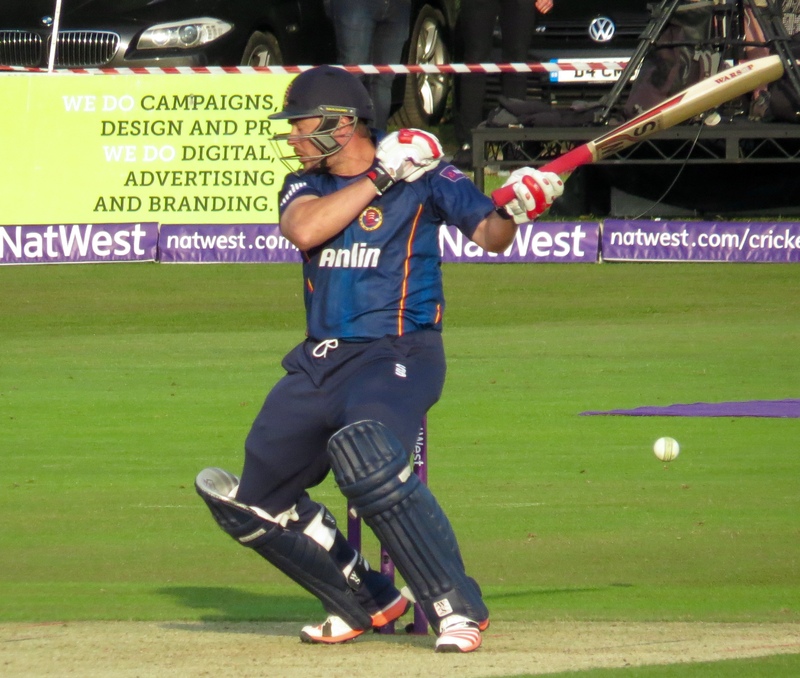 Essex were on 135 for 4 and having had a fast start had been slowed down by Kent. 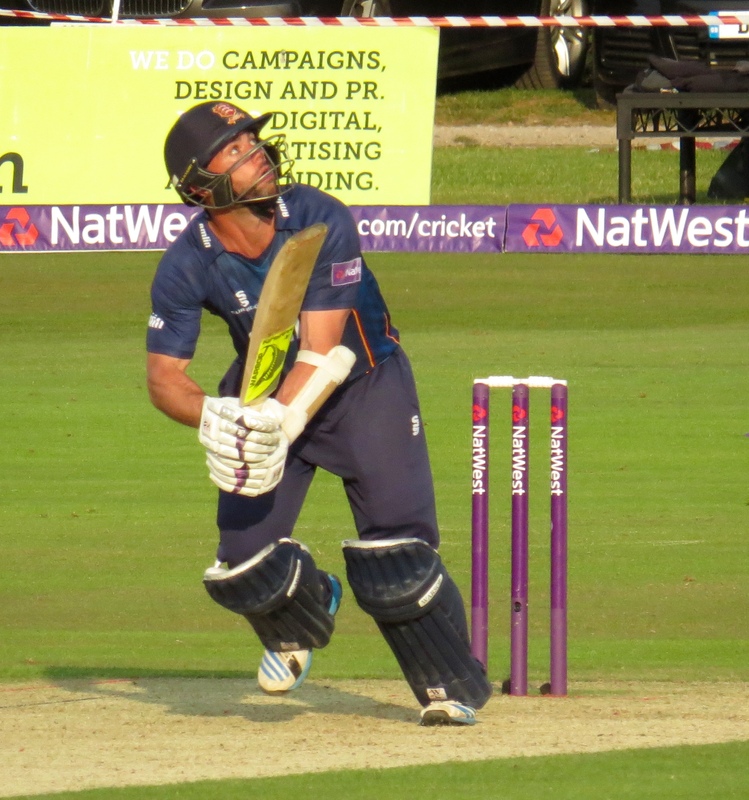 They reached a total of 173 with James Foster scoring 14 before being bowled by Mitchell Claydon. 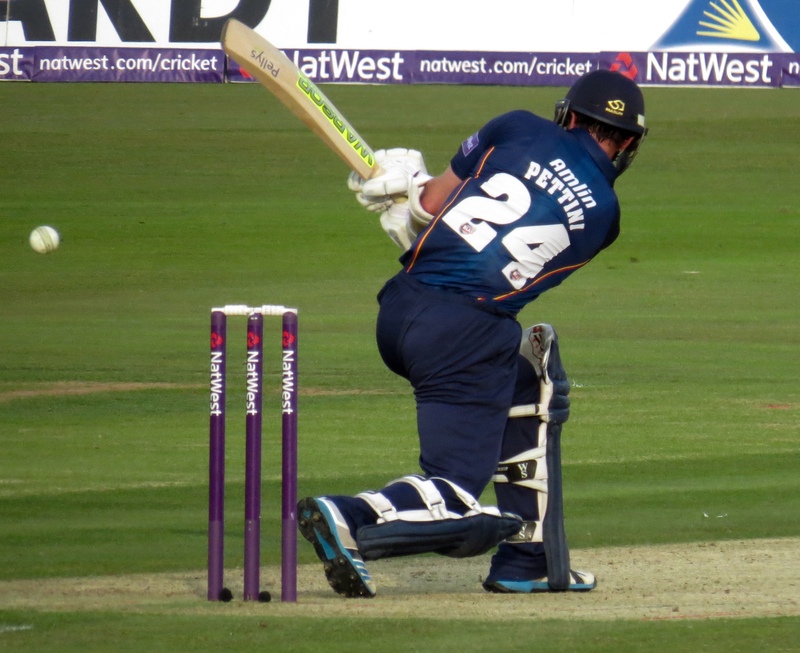 Pettini made 56 from 45 balls his was the last wicket to fall as he was caught by Stevens from the bowling of Coles. 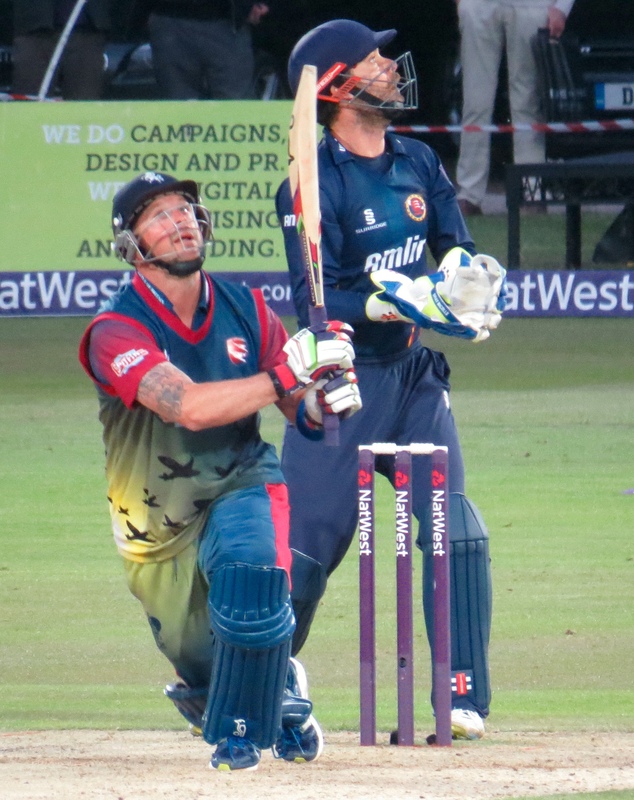 Graham Napier was not out 13, Nick Browne not out 6 – 173 didn’t feel enough, and so it was to prove. 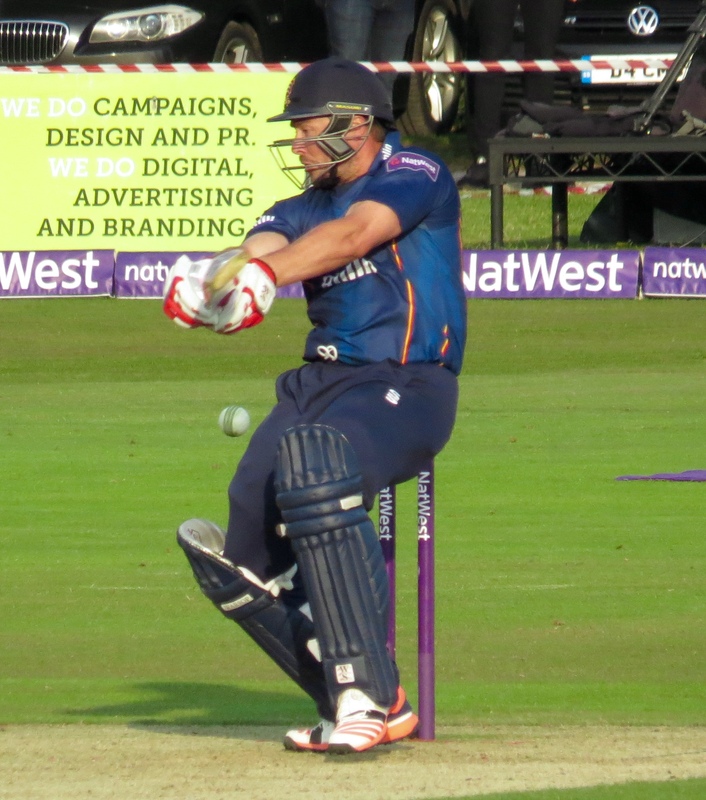 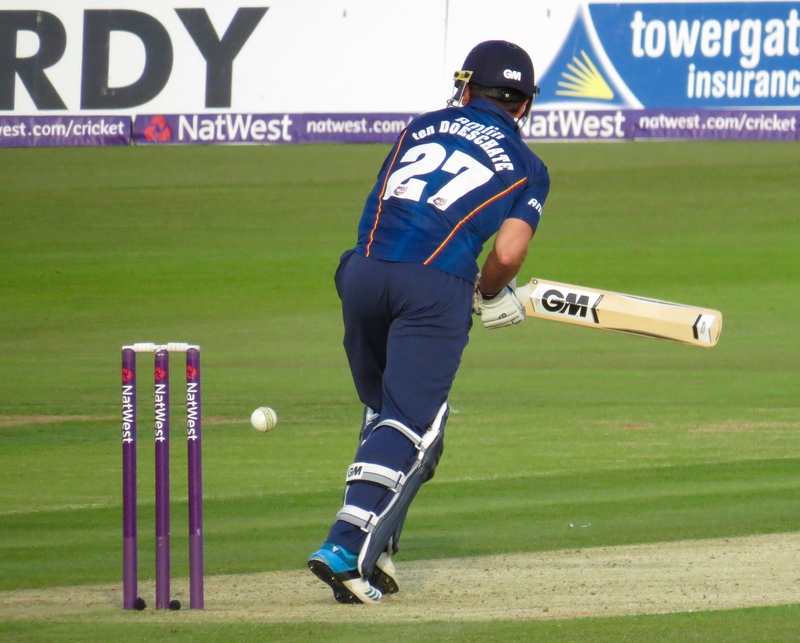 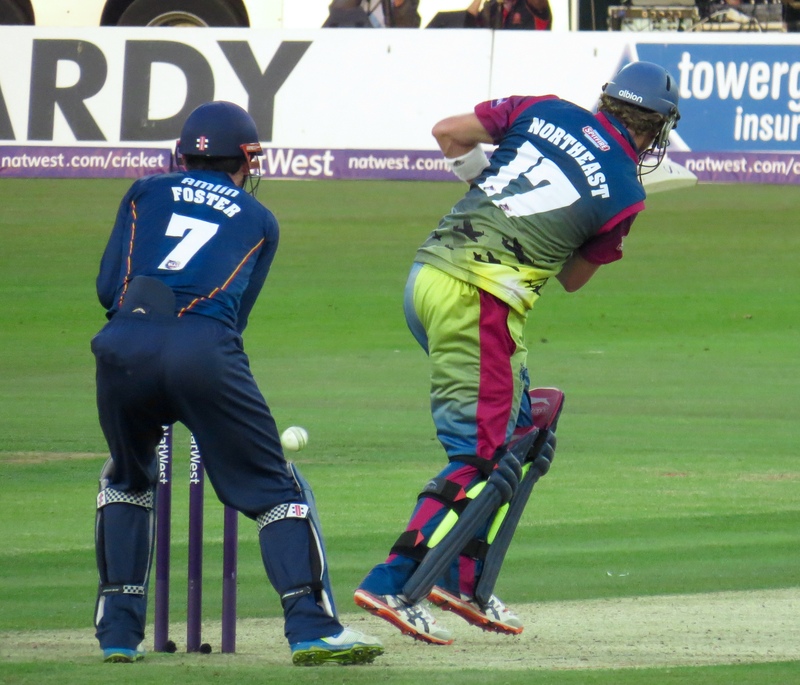 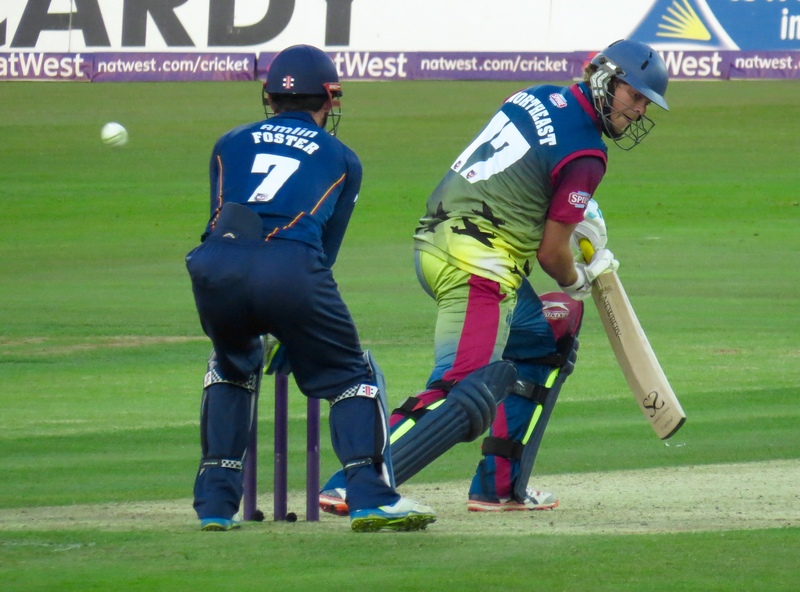 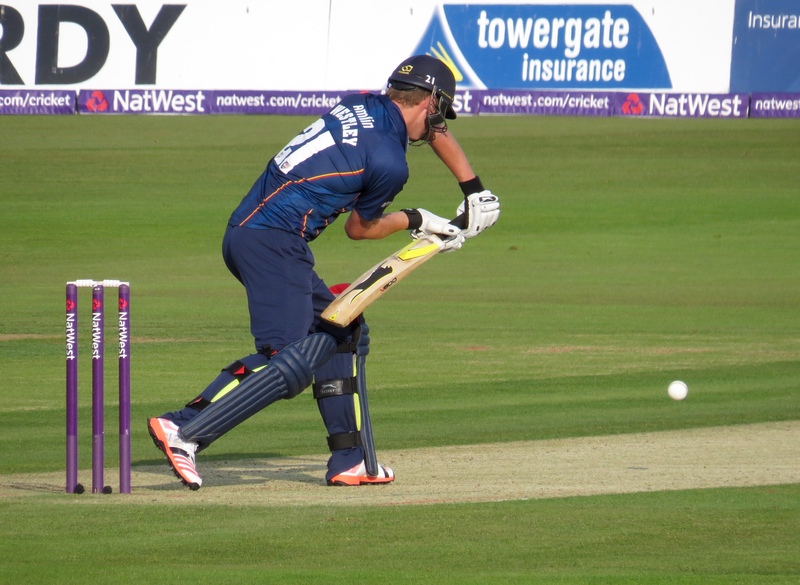 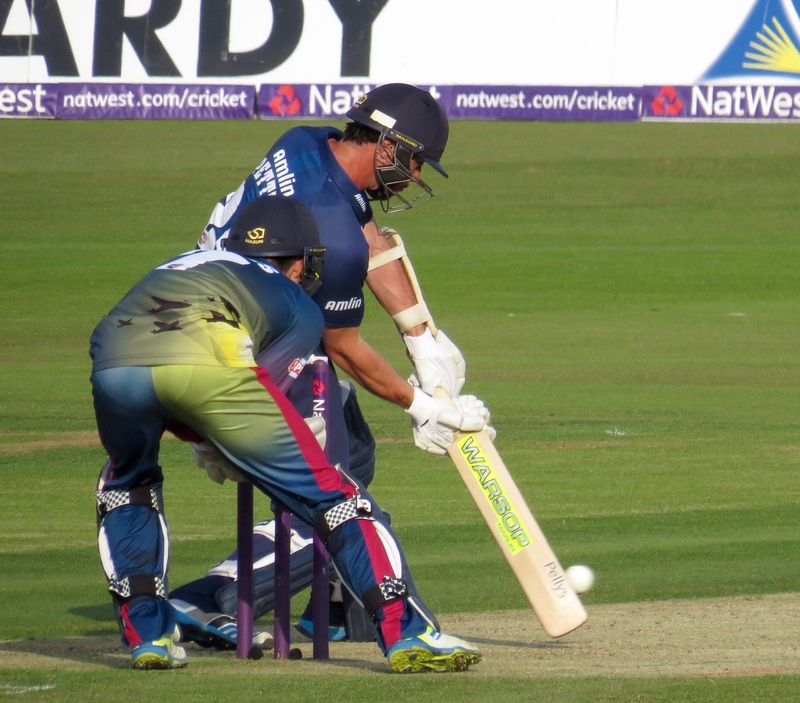 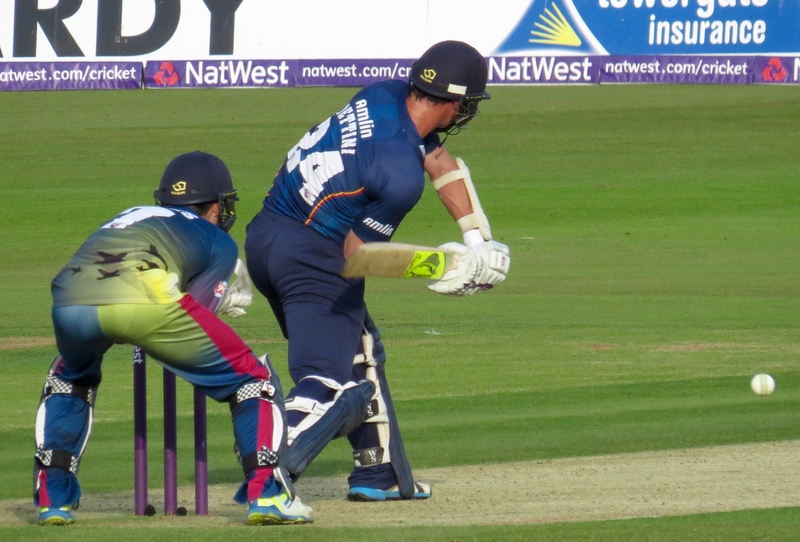 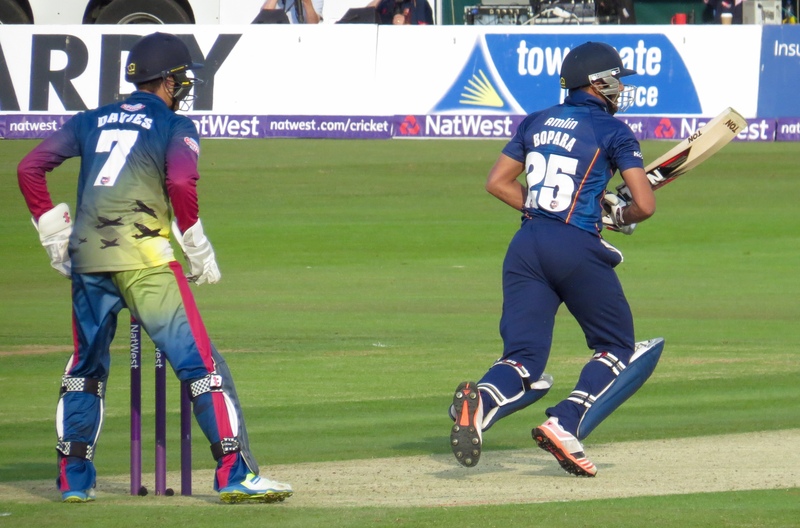 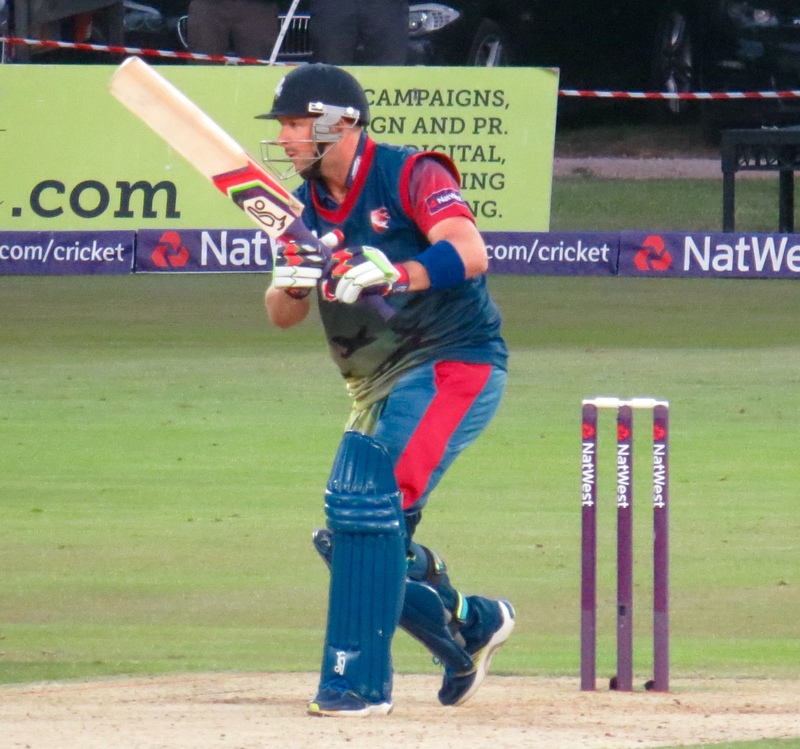 Kent faced an early blow when Joe Denly was caught by ten Doeschate for 1 – the solitary run for Kent! 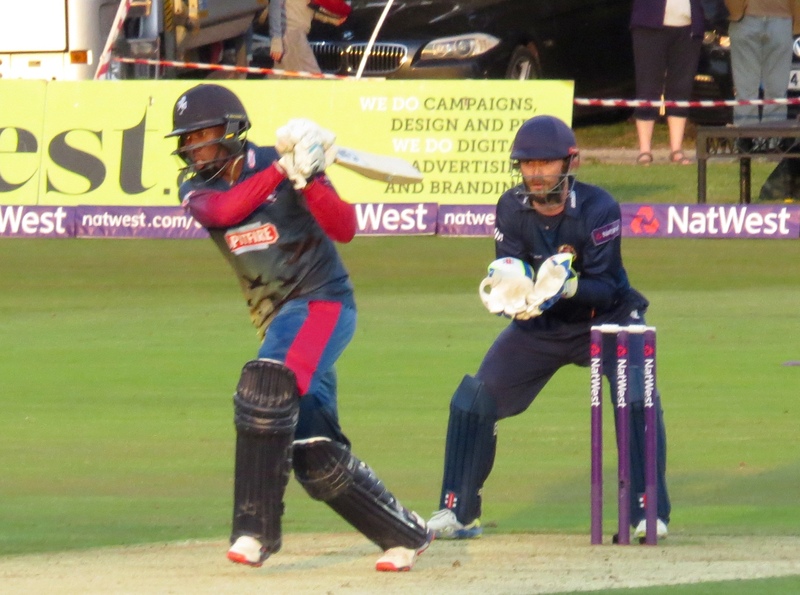 However Daniel Bell-Drummond with a steady 61 from 49 balls and captain Sam North-East with a highly entertaining 90 from 52 balls including twelve 4’s and two 6’s ensured victory for the home team. 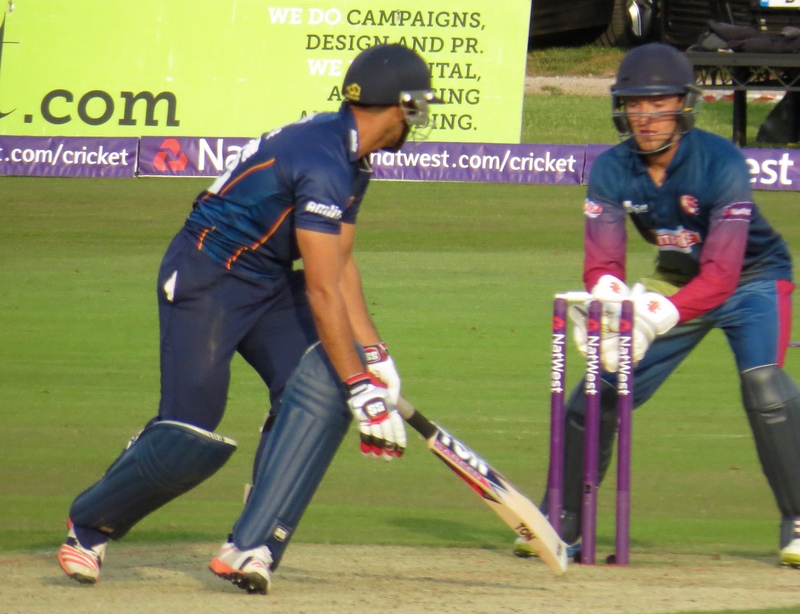 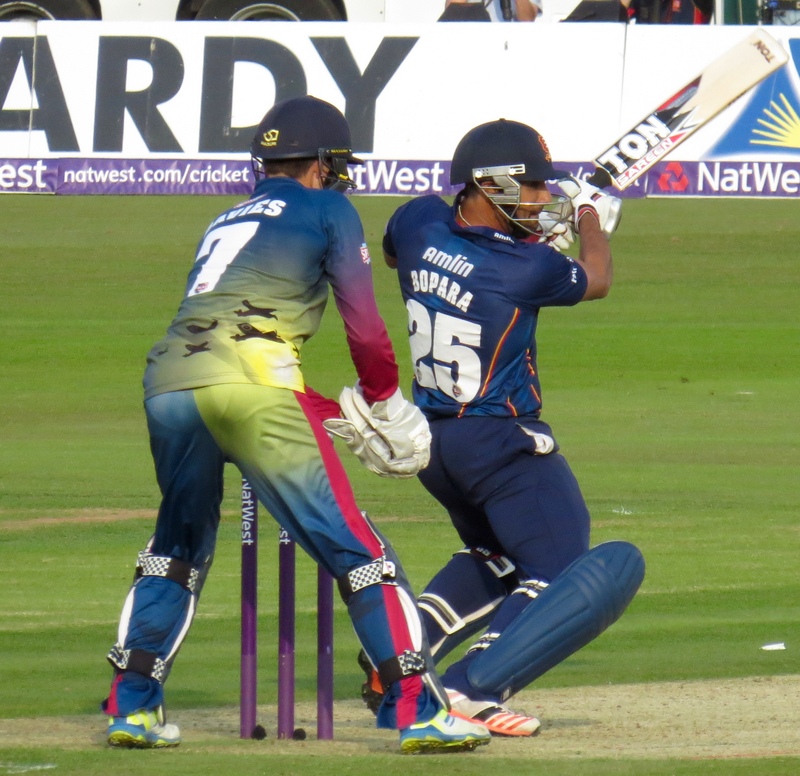 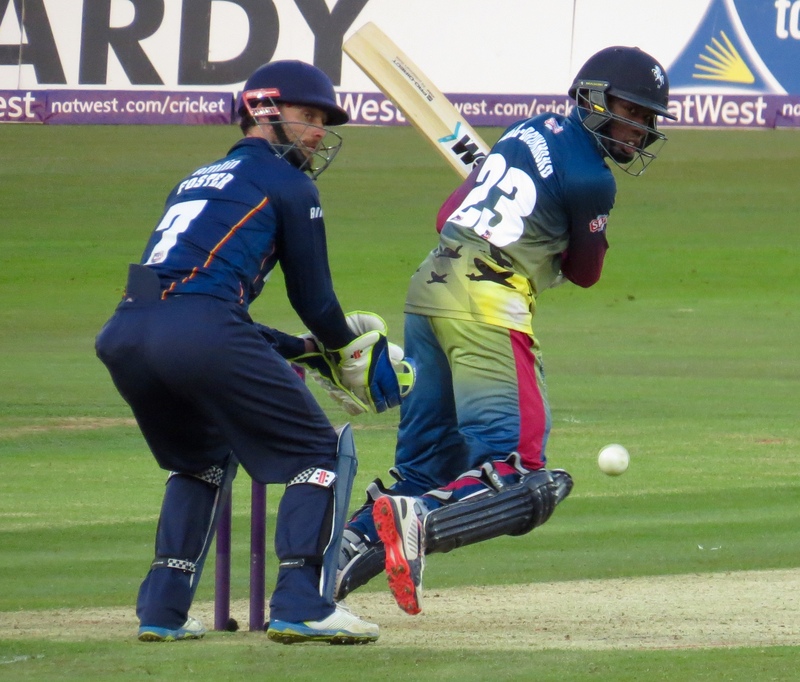 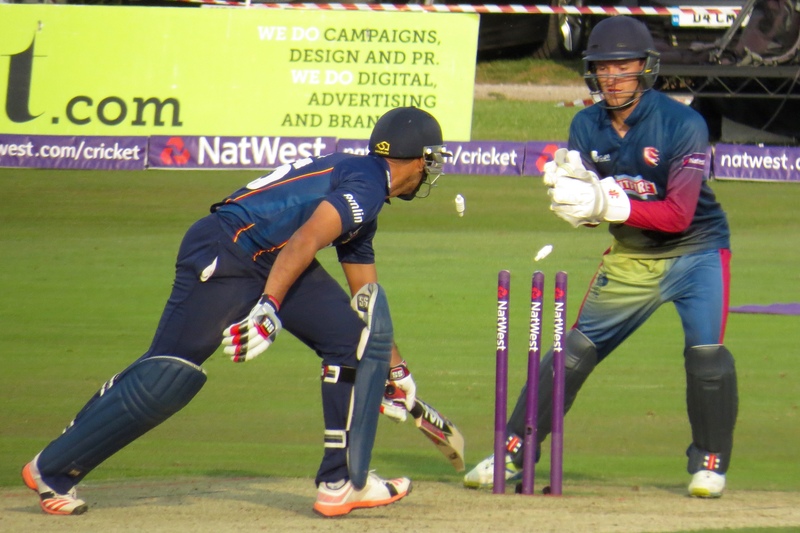 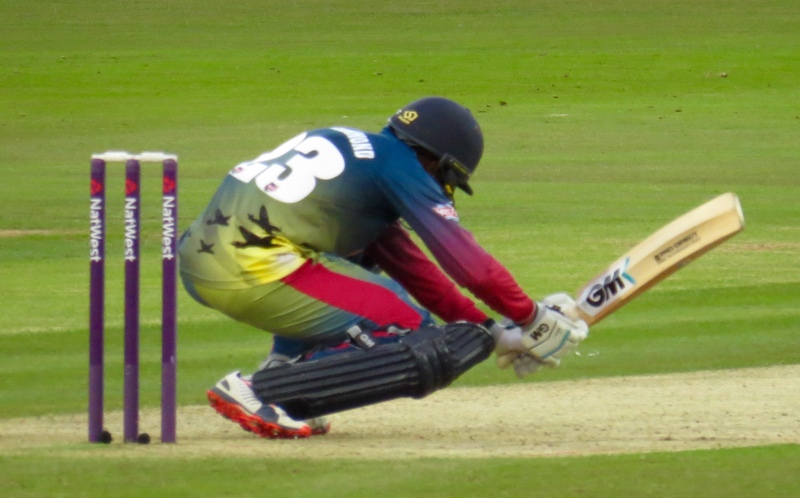 The Essex bowlers seemed to have no answer to these 2 batsmen – with the 1st wicket having fallen on 1 Bell- Drummond was bowled by Napier with the score on 127! 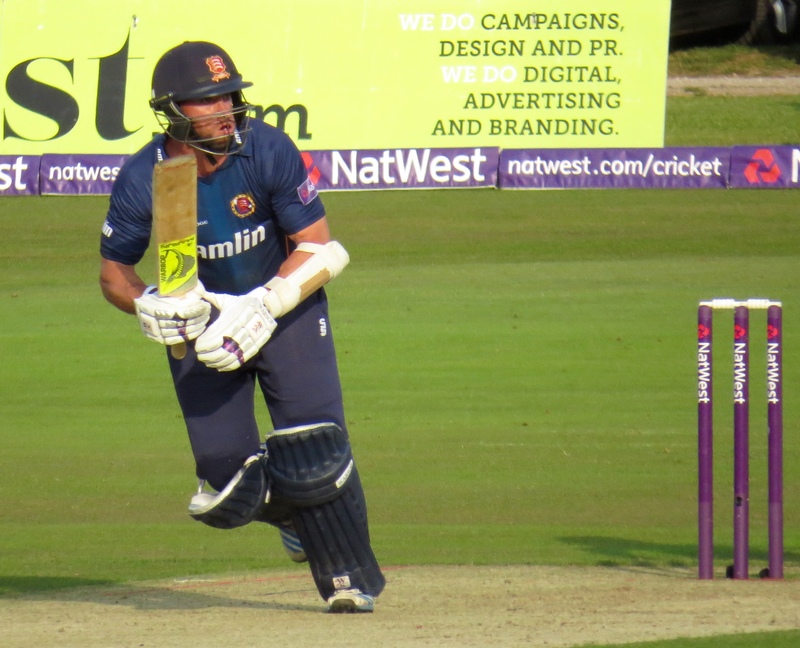 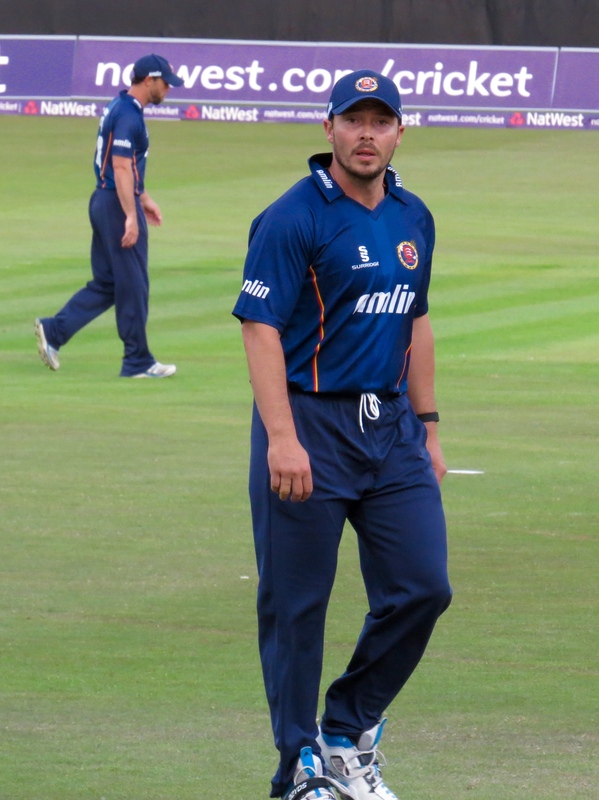 Stevens added 11 from 11 balls before a great catch by Pettini – surely the Essex Man of the Match – from the bowling of Bopara. 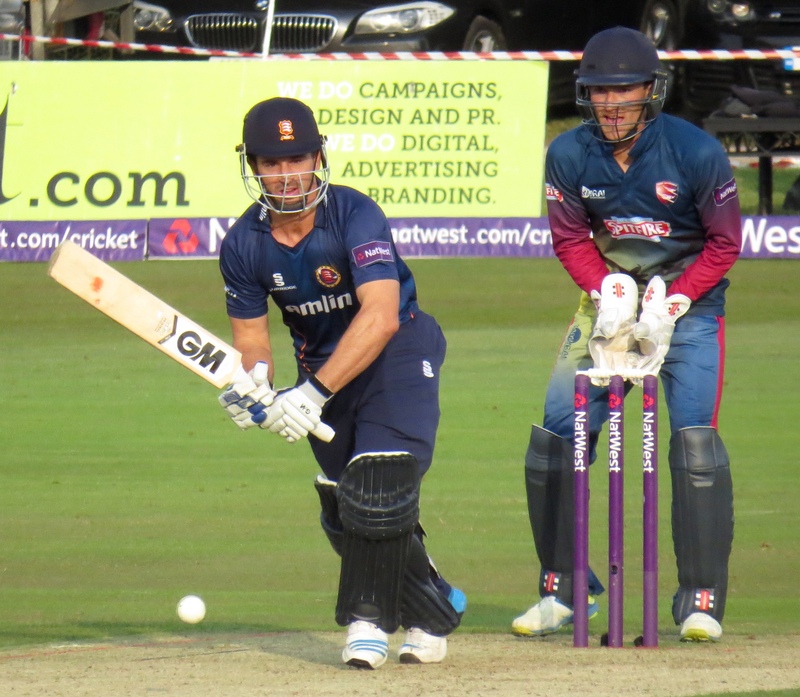 Sam North-East who was rightly the man of the match was caught by Nick Browne from the bowling of Shaun Tait with the scores level. 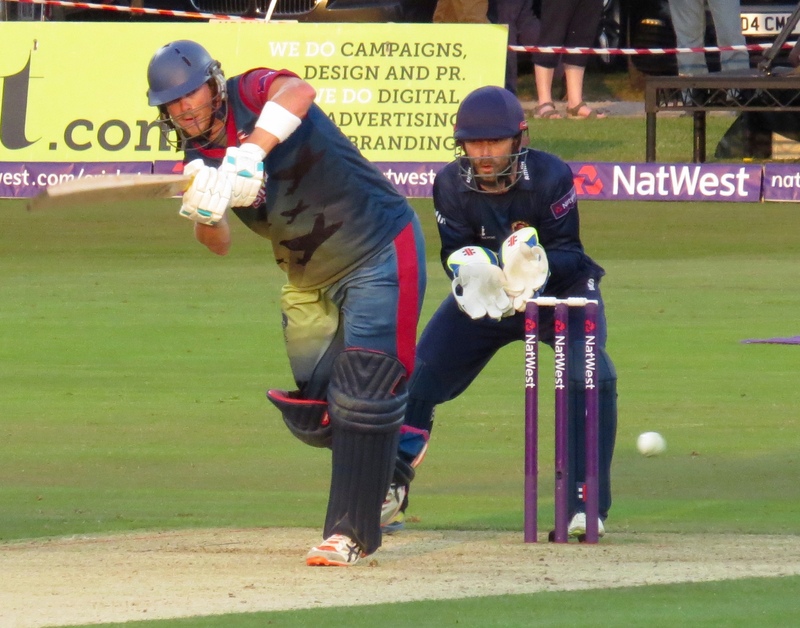 Kent eased to victory with 5 balls remaining with Alex Blake not out 3 and Coles at the wicket but with no runs to his name. 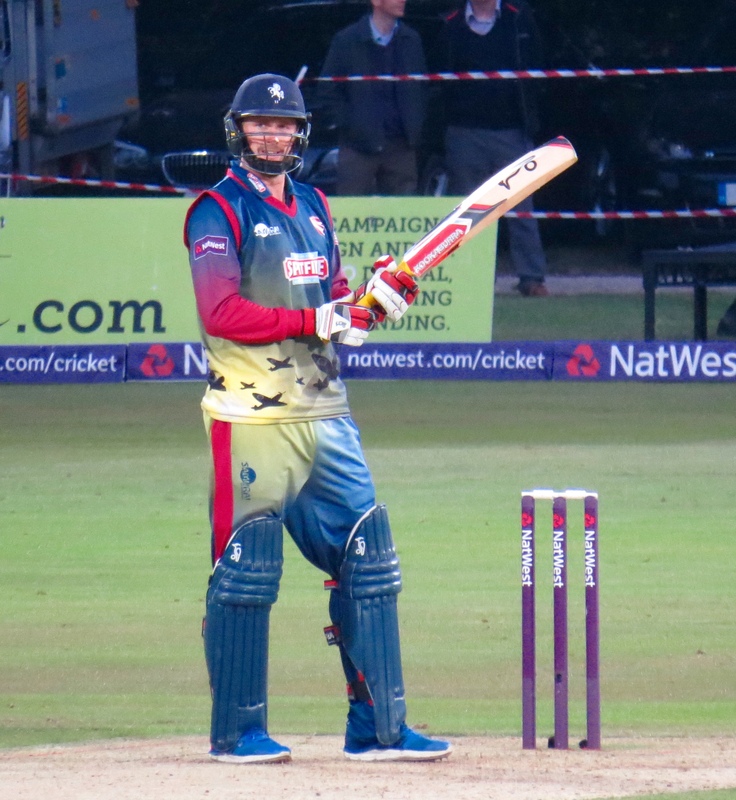 So, a long journey with the wrong result for my team, but a thoroughly evening all the same! 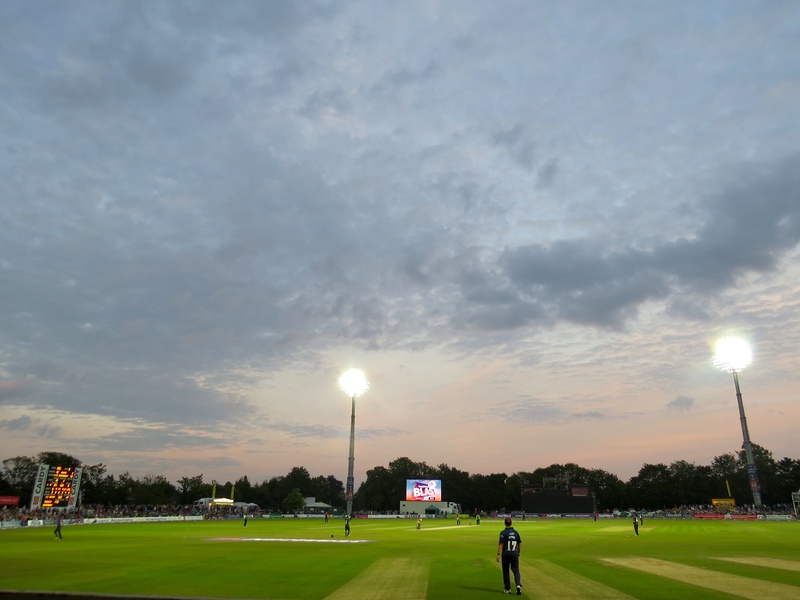 I’ll certainly go back to Canterbury, it’s a beautiful ground! 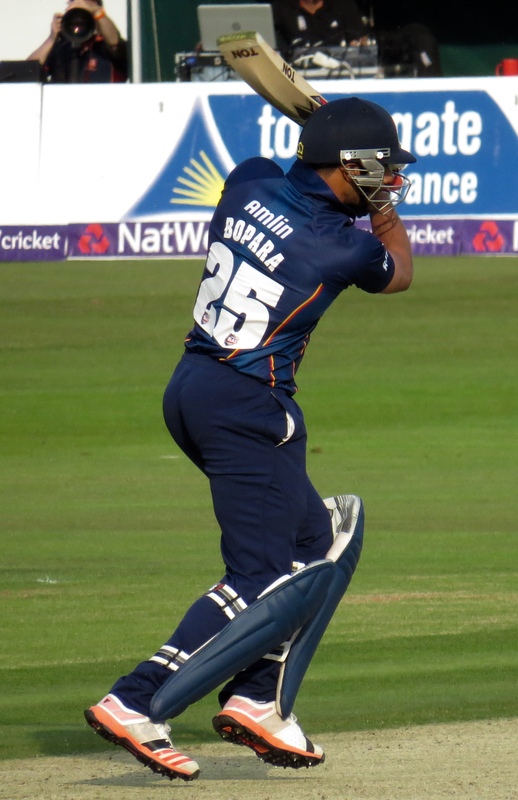 The journey home was a much smoother one, taking about an hour and a quarter, in spite of the driving I can’t think of a better way to spend a summers evening! 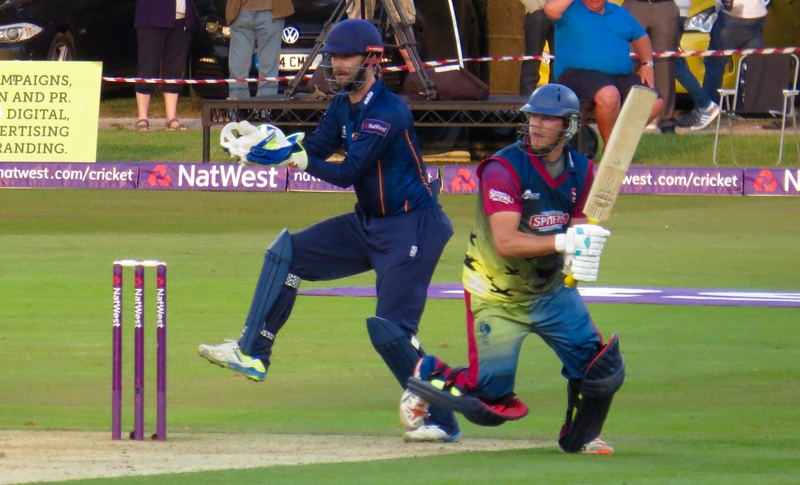 I’m getting shoddy on getting my facts – so just one! 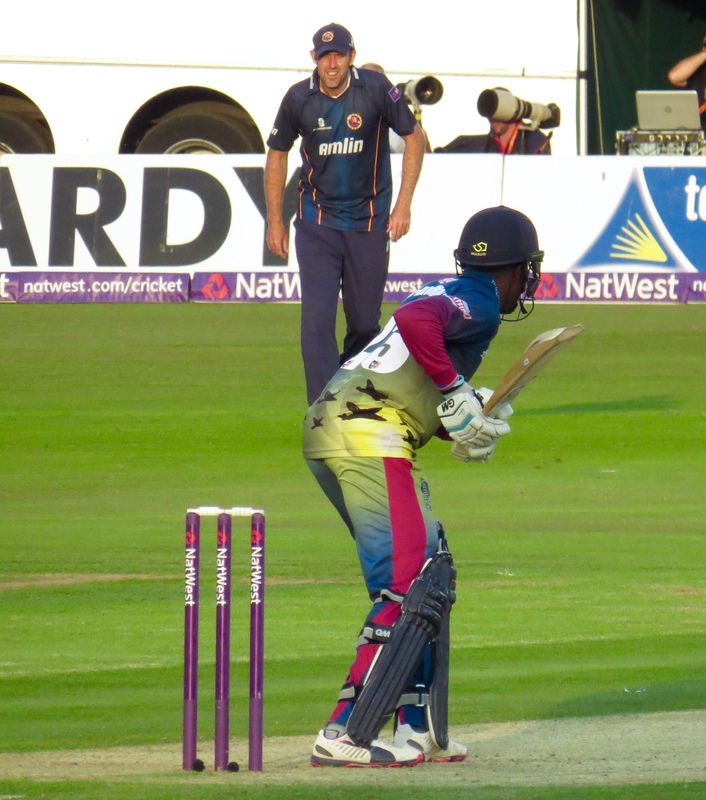 Oh, and as always at cricket – ladies loos – plenty of them, no queue unlike for the men, clean and hand wash and towels!